It was time for a new business card. Gosh, you could spend days looking at advice for how to create the most effective business card. Instead of worrying about what everyone else might want in my business card, I decided to make a card I liked. 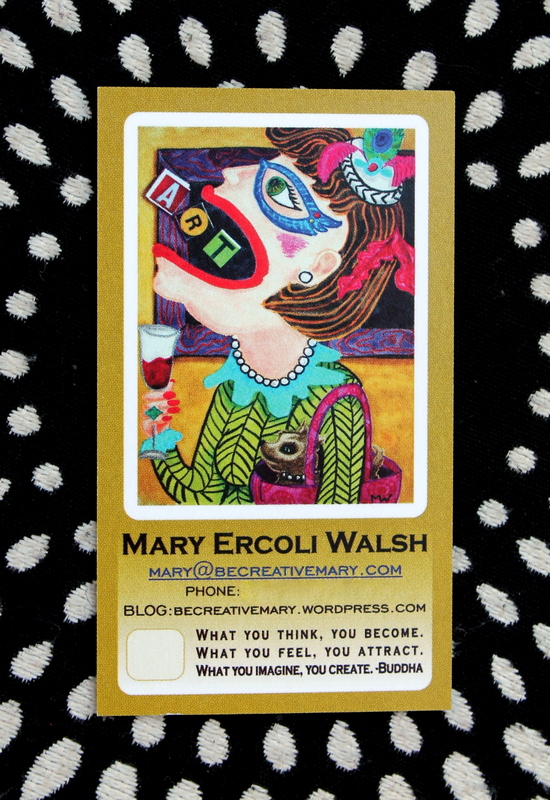 I like business cards that are visually stimulating. Color and images are the fist ones I go for. I also love wit and humor. If you get me to think, ponder or laugh, then its a keeper. I think I nailed it on the head. I said it above “For me it’s seeing a card…” Seeing a card. That is what I do. I’m a visual person. I bypass black and white standard press cards and I gravitate towards ANYTHING VISUALLY STIMULATING!!! The quote however, the quote is there 100% for me. I cannot for the life of me figure out what the rest of the world wants in an artist. What can I write on a business card that will seduce you into x, y or z? …. beats me. I make art because I can’t not. How’s that for a catchy slogan? 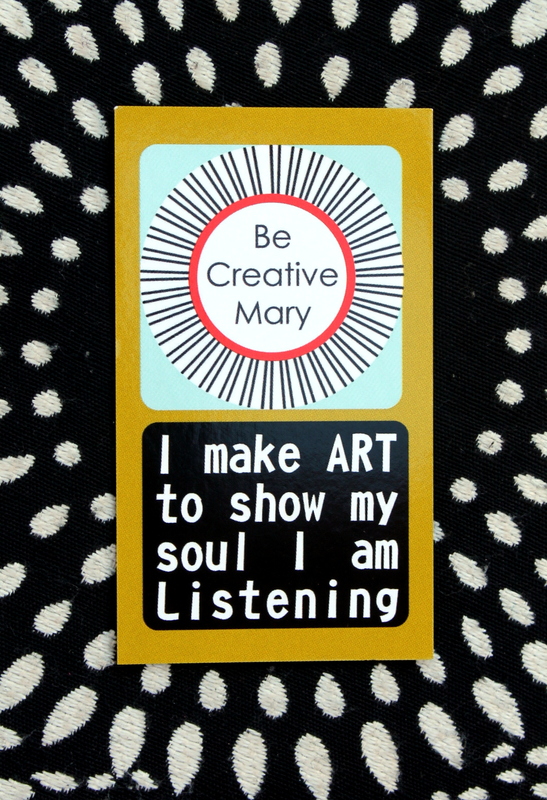 I put the quote ” I make art to show my soul I am listening” because the second I was done creating the template for this card I wanted my card up on my bulletin board so I could read the quote over and over again. That’s a good enough reason for me. Maybe someone else will want it on their bulletin board and it will constantly remind them to wake up every day and do the thing that fills their soul with purpose and with happiness. The back of the card of course needed to have the vital contact info, but that doesn’t take up too much space. I figure if you are at the point of wanting to contact me, you’ll squint and get the info. Might as well go for the amusing factor instead. 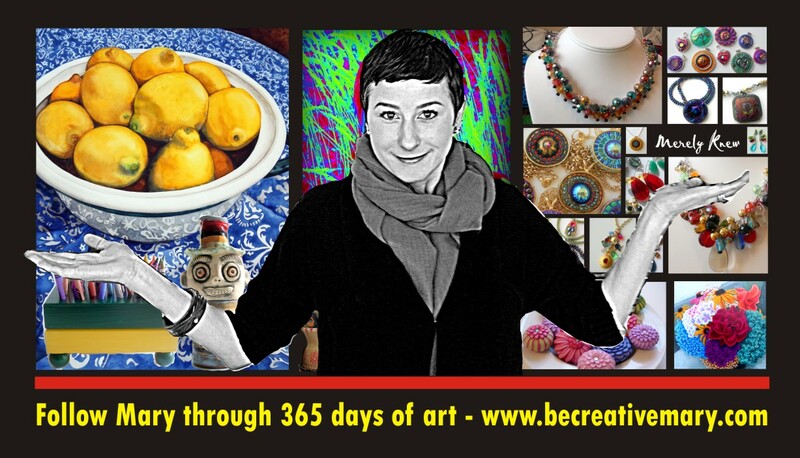 The painting I added to my card is titled “the art consumer” which is poking fun of art show personas. My mother has a gallery and we always find the most eccentric art aficionados. It’s also a little nod to a self-portrait because those are my eye-glasses and let’s just say I have a penchant for visually stimulating attire. 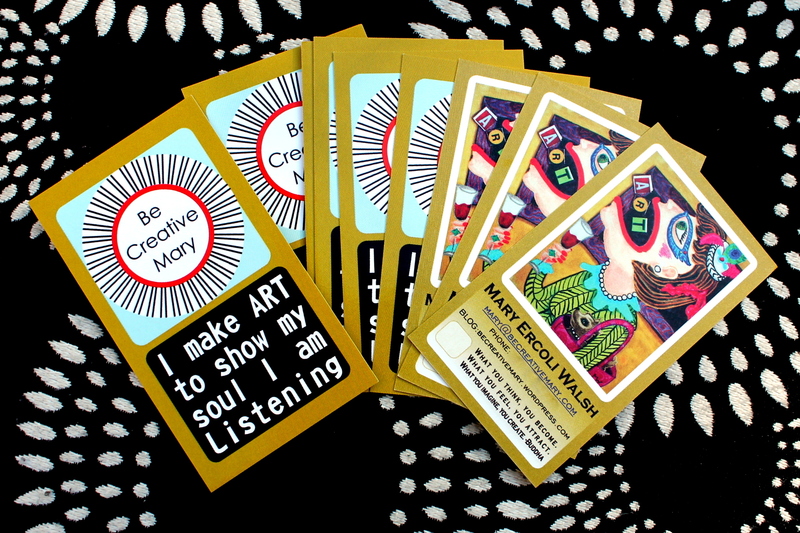 This was funny, I just got my new cards in time for the art festival so I dropped a stack on the table in our booth. There were people coming and going and I was making idle chit-chat with the passers-by when this woman read the quote “What you think, you become. What you feel, you attract. What you imaging, you create” I stopped and looked at her and said “boy that was beautiful, where did you get that?” The woman looks down grabs my card and hands it to me. Yep. In the weeks since I’d designed it, I had forgotten I had added that quote to the bottom… I’m such a knucklehead! I think I need to add that side of the card to my bulletin board too. If only to remind me what I wrote! All said, people snatched up the cards. I’m pretty sure it wasn’t to contact me and yet they will in a sense still get a little piece of me. Maybe, someone will be having one of those crucial moments in their lives, where big questions are getting asked and answers can only be found within. Maybe out will pop the card from their coat pocket and they will read some words of wisdom and it will be just what they needed to listen to their soul or to imagine or create. Or better yet, maybe just laugh. That them there, would fit my definition of a great business card! I LOVE this card! It is interesting and dare say-creative? !